Direct Payments are for reimbursement payments other than services. Please complete the Direct Payment Form and submit to the Business Office. Fill in Payment Information including Request Date, Payment Amount, Payee Name, Remit Address, Mail Stop, and Last 4 Digits SSN or ITIN. For a Direct Payment Form to be processed, a 204 Payee Setup form must be submitted. For information regarding the 204 Payee Setup form, go to 204 Payee Setup form. To verify if you have previously filled out a 204 Payee Setup form, contact the BSOE Business Office. Mark the box for 204 submitted or on file. Fill in the Requestor Information Section with the requestor name, department / division name, phone number, and email. Payee Status questions are to be answered with a yes or no selection. If you are unclear what your Payee Status is please contact the FAR Office for Payee Setup help. The FAR Office email is finpolicy@ucsc.edu. The Payment Type section distinguishes between payments to an individual and payments to a vendor. Once the payment is determined to be to an individual or a vendor, the type of payment must be selected. A list of all payment types is given below with descriptions. Find the description that best fits your payment. If you have questions as to which category your payment falls under, please contact Denise Goss (degoss@ucsc.edu) at the Business Office. Provide a detailed explanation for payment in the Explain Payment section. Fellowship/Scholarship - Monies awarded in support of higher education. 001040 - Scholarship, Non-Qualified: Non-Qualified Scholarship for a US citizen or resident foreign national when some portion of the scholarship is non-qualified. Applies to undergraduates only. Funded Activity - Payment made to individuals for expenses incurred attending or supporting an event funded by UCSC (such as a conference, symposia, workshop, training, or on-going program activity). Payments to other entities need to be on PO's or travel forms. All fund sources are allowable; except participant support as budgeted on extramural awards. 001140 - UC Funded (Hosted) Activities: Payment made to individuals for expenses incurred attending or supporting an event funded by UCSC (such as a conference, symposia, workshop, training, or on-going program activity). Payments to other entities need to be on PO's or travel forms. All fund sources are allowable; except participant support as budgeted on extramural awards. Gift (Non-Cash) - Reimbursement of non-cash gifts and/or flowers. Retirement: Tangible gift or non-negotiable gift certificate/card (not to exceed $400 per person). Sympathy: Flowers or similar items (employee limit - $75 per person; non-employee limit $200 per person). A purchase order is required for direct payments to vendors for non-cash gifts or flowers. 001120 - Prize / Award Payment: Prizes and awards are restricted by University policy. See Business and Finance Bulletin G-41 for restrictions related to employee awards and Business and Financial Bulletin G-42 for restrictions related to non-employee awards. Honorarium - Payment to an individual for a special service or achievement that propriety precludes setting a fixed price. State funds may not be used for payment of honoraria. UC employees must be paid through the payroll system (state funds not allowed). Online Training & Development - Staff Online Training and Development. Participant Support - Use with extramural funding only. Requires specific EMF budget line item. For expenses paid to or on behalf of a participant (non UCSC employee) sponsored by UCSC. Prize / Award (Non-Cash) - A prize is offered in a competition or a contest of chance. An award is made in recognition of scientific, educational, artistic, literary, or civic achievement. Cash awards are allowed only for UC employees and must be paid through the payroll system. 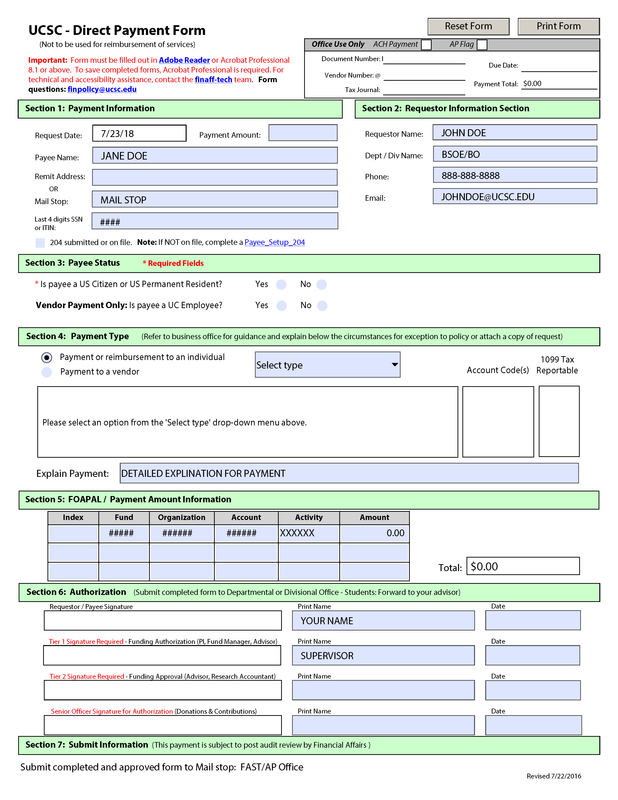 Salary Advance - Forward form to Payroll Office. Subject Payment - Attach original research agreement documentation. If Payment under $5,000.00 charge directly to funding source. Over $5,000.00 charge to Index Code 112160. Supplies Reimbursement - Delegated authority for reimbursement of purchases of goods (departmental supplies, etc) should be discouraged as there are other options available, including purchasing cards and purchase orders. Note: Reimbursements exclude payments to third parties for services. Reimbursements require original receipts. Donation / Contribution - Restricted use, typically student fundraisers. May not be to a political entity or support a political purpose. Fundraised donations require a copy of deposit. Must be charged to unrestricted funds, and Sr. Officer approval required. Membership - University sponsored memberships must be directly related to the proposed member’s University responsibilities. Obtain institutional rather than individual memberships to allow participation by several or alternate employees. Memberships must use a UCSC address for business verification. Postage / Outbound Freight - Include business reason for postage or freight charge. Refund to Research Agency - To refund an obligated balance. Subscription - Purchase of magazines and periodicals. Specify no. of times per year published. Explanation required. Other / Miscellaneous - Non-invoiced payments: refunds, monthly rental payments, uniform allowances. (Not for travel, entertainment, or moving). Include Employee Vendor Disclosure Form. The FOAPAL / Payment Amount Information is required for processing. If you are unsure about what Fund, Organization and Activity Code to use, contact your Tier 1 Authorizer. If you do not know who your Tier 1 Authorizer, please contact Denise Goss (degoss@ucsc.edu) at the Business Office. The account code will be populated in Section 4 under Account Code(s). Descriptions of these corresponding Account Codes can be found in Section 4 of this guide. Direct payment amounts are to be added for each FOAPAL line. The total amount of the direct payment will self populate. Authorization signatures for Requestor and Tier 1 Funding Authorizer must be completed before submitting to the BSOE Business Office. If you do not know who your Tier 1 Funding Authorizer is, contact the Business Office. The Submit Information section will be completed by the Business Office.